Today we launch our new campaign #BiggerIsBetter [Bigger Is Better]. We hear over and over again how much people struggle with the size of wheelchair accessible toilets. Unfortunately, the size suggested by building regulation guidance is far too small for the types of wheelchairs and scooters that people use today. We need to raise awareness and explain why meeting building regulations does not mean they are meeting their legal duties to provide usable toilets under the Equality Act [Disability Discrimination]. Very few businesses are aware of this. Wheelchair users can often not get into these toilet spaces, turn around or transfer safely. They become unusable. An unusable toilet might as well not be built. Every toilet that gets built to this size could mean decades of being unable to use that toilet. If nothing happens now – the future will remain bleak. If the standards are not going to change, then the only way forward is to reach out to as many businesses and new developments as possible and encourage them to see that bigger is better. We need to encourage larger spaces and where possible Space to Change or Changing Places. Without larger spaces, wheelchair and scooter users will continue to struggle to live as equal citizens in the UK. Please join the campaign and help spread the word. Share our posters, pictures and your experiences. For buildings completed since October 2015, the following features will satisfy the requirements for sanitation provision. These features are essential so that people who are blind or have a visual impairment, can access the toilet. Contrasting colour of door handles, door and door frames – always good to know where the door is and how to open it! Surface finishes of fittings and support/grab bars must have a particular level of contrast with the wall and floor (and the wall and floor should also contrast). I have been into many toilets where there is a white floor, white walls, white toilet, white sink, white emergency chord ….. a field of white glare to many people with visual impairments. I also find it a bit disorientating and I have good vision. The statement on what is meant by ‘visual contrast’ has been deleted in the latest Building Regulation Doc M. Further work is being done to evidence what level of contrast or finish might improve visibility. Light reflected of surfaces can be measured – called LRV (Light Reflection Value) when a surface is illuminated. Nearer to 0 would represent black and nearer 100 represent white on this scale. The difference in visible light reflected provides differences in these values. A LRV difference of 30 was generally a good figure to use and to avoid high gloss finishes. This would enable more people to tell the difference between surfaces when their vision is impaired – which may cause a reduction in the hue (nature of the colour) or chroma (intensity of the colour). For any toilet room / toilet block, the following are also ways to meet the Equality Act 2010 to complement the above. A Braille description is good practice for any visual signs (toilet door symbol, warning signs, how to operate equipment etc). Appropriate space inside or outside the toilet room for assistance animals. People with sight loss need to be able to find a toilet and use it to have equal access to sanitation. This might mean altering signage or providing someone who can audio describe where the features are in the toilet. I’ve been to toilets where the toilet roll is randomly placed on the floor, a shelf or ‘pick a wall, any wall’. This would probably be unlawful as it creates barriers for people. The last thing you want to be doing is feeling around a public toilet or having to get so close to see something that you can almost touch it with your nose. Pretty disgusting. Poor lighting, flickering lighting – it all makes a difference. It is also useful to consider that some people with sight loss may also have other impairments such as learning difficulties, hearing loss, brain injury, or a person be on medication which impairs vision – so they should be equally able to use an accessible toilet. Attention to lighting can help people with autism as well – so insist on new accessible toilets meeting the full British Standard as a minimum to feel confident you have tried to be as inclusive as possible. Disabled people of all ages, and those who support them, are putting their health at risk because of lack of usable toilets within NHS hospitals and clinics. Inaccessible toilets at UK hospitals and clinics are also having an impact on the health and recovery of people who may not identify themselves as a disabled person. People with dementia, bowel/bladder disorders, those receiving treatments for cancer or heart/lung disease, rehabilitation therapies or mental health illness for example. Our 43 page report with a summary of key findings (below), brings together the experiences of patients and families. Contributors all have a long term health condition or illness which makes it difficult or impossible to use the toilets currently provided. Download the report from the link below. We a very grateful to everyone who participated, providing much needed insight of the urgent need for equality of toilet provision, within the NHS, to support physical and mental wellbeing. Due to stigma, embarrassment and sometimes cultural or gender reasons, patients and visitors rarely complain about difficulties accessing/using the toilet or sharing their experiences. Provision of toilets are the most overlooked Human Right contained in the European Convention on Human Rights and the UK Human Rights Act. Access to sanitation is a Human Right being ignored within the NHS. Equality Act duties are not being met because a worse standard of toilet provision is provided for disabled people with no reasonable adjustment. Patients who do not meet the Equality Act definition of ‘disabled’ are also affected by lack of facilities due to short term illness, injury etc. NHS buildings are failing to meet building regulations or strive for British Standards. Brain injury and balance disorders. Some toilets have been found to be unsafe e.g. by not using non-slip flooring, no emergency cords / unreachable cords or not having the right type and placement of support rails. Hospitals are failing to ensure dignity, safety and well being of patients, staff and carers by offering unsuitable alternatives to standard toilets. There are 155 acute NHS trusts plus 56 mental health trusts as of October 2015. Many having multiple buildings across several locations. Out of all these buildings, only 42 provide a basic Changing Places toilet with hoist, extra space and bench access. NHS staff, for the safety of themselves and patients, can not assist by lifting people from wheelchair to toilet or from a seated to standing position. Where Changing Places are not provided or other suitable equipment such as adjustable height toilets, patients must take a family member to do manual lifting/assisting. This has caused long term back pain for many carers and is painful and dangerous for those being lifted. NHS staff are not familiar with the needs of patients regarding sanitation which results in poor signposting to toilets / inability to locate a toilet and unsuitable ‘alternatives’ being offered. Not all toilets are shown on hospital maps/signs – and the facilities in each are variable, resulting in difficulty locating a suitable toilet. Very few NHS websites detail information about where toilets are located and the facilities in each – making planning for an appointment difficult. Toilet signs are often difficult to understant, see or follow. Women are worst affected due to the need to be seated on the toilet, menstrual hygiene needs, increased risk of urinary infections and being more likely to have bladder problems such as urgency. Patients say they would rather miss appointments because of fear of not having toilet access. Families are prevented from visiting their spouses/children or friends in hospital because they can’t access a suitable toilet. Patients are choosing to stay at home rather than go to A&E where long waits and no usable toilets are normal. Patients are having surgery to remove the need to sit on a toilet (ostomy or suprapubic catheters) because of access reasons not because of a medical need. A healthy adult empties their bladder every 2-3 hours, yet many disabled patients are avoiding food and liquids for several hours because they know they can not use toilets at hospitals and clinics. Avoidance / withholding urination and defecation has caused kidney, bowel and bladder damage. Patients are taking extra medication to prevent urination or defecation when outside their homes for several hours impacting work, leisure and attending health appointments/treatments. Wheelchair and Scooter users can not get close enough to the toilet for safe transfer. (People with a wide gait, obesity, users of frames/walkers or crutches are also affected by this space restriction). 82% of powered wheelchairs will not fit into the transfer space at the side of a toilet that meets current building regulations. Out of 613 models of scooter and powered wheelchairs – only 140 can turn around in the turning circle recommended in the current building regulations. Severely disabled patients are spending several hours in soiled pads whilst they attend hospital appointments because of no hoist or changing bench facilities. The NHS, by its very nature, will serve a higher percentage of people who need very specific facilities to use the toilet. Therefore, adapted toilets need to be of a higher quality to maximise independent toilet use and maintain a high standard of dignity, safety and hygiene compared to other ‘away from home’ facilities. spend longer on the toilet (and getting on and off the toilet). 30 – 40 minutes is an average time. need toilet provision beyond what is required within building regulations e.g. extra space, access to bidet facilities/washrooms, access to a hoist and changing bench, access to a height adjustable toilet or other equipment. To substitute a dedicated room (that non-disabled people are provided with) which has a flushing toilet, sink, waste bins, toilet paper, privacy (locked door/single person use) and space for any of the following (which are common practice alternatives) is not appropriate and probably unlawful. offering no support or equipment – no usable toilet. offer of a commode, spare bed / cubicle (often with a wait) alternative for people who could use a toilet room if one was provided. 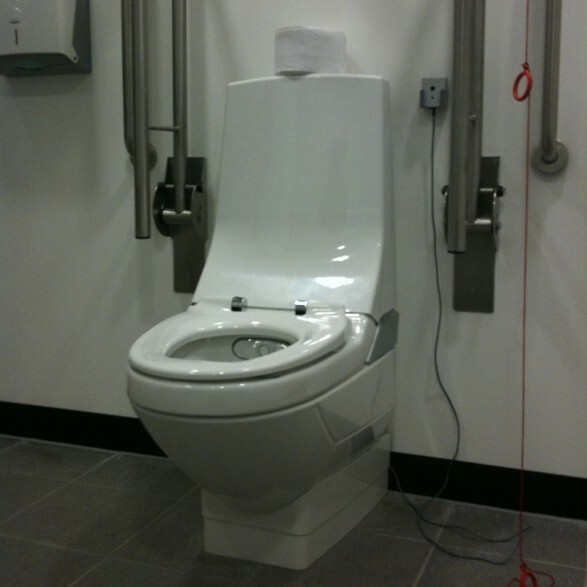 suggesting patients pre-arrange hoist and nursing support (where space exists to safely use these as a hoist can not be used in a standard wheelchair accessible toilet space). Few people know exactly when they will need the toilet to plan days in advance. Many alternatives cause pain, embarrassment, and mental distress. Solutions exist because people are able to use the toilet in their own homes – so why not in hospitals and clinics? What if toilets had feelings? Toilets need your help, today. Today we bring you a toilet and a sink which have not been treated equally like the other toilets. Left neglected and abandoned by their owners. No toilet should have to be this way. They have been incapacitated by the lack of care and maintenance given to the ‘regular’ toilets and if they could ask for your help – they would. They are crying out in desperation. All they want to do is provide a safe, hygienic place to go to the toilet. A place of comfort and dignity. Many will see only pain, tears and distress. Wrong fittings, missing support rails, cramped spaces … the list is long. All they can do is watch helplessly. Today a frail elderly man fell because there was no support rail – and no emergency cord to get help. I felt responsible. Yesterday a severely disabled little boy had to be changed on the floor, right next to me and the bin. He was too heavy for the baby changing table. I kept willing him to try not to wave his arms around and touch me because of all the germs. Of course he couldn’t help it. My heart was breaking. I wanted to help. There was nothing I could do. My room didn’t have anything better to offer. People stay at home more where they have fully accessible bathrooms – leaving toilets like these isolated and lonely. Act now and together we can change things. You can do something to help toilets like this. Customers – tell people what is wrong. It costs you nothing and provides businesses with an opportunity to put things right. Managers and architects – offer hope to these poor toilets. No toilet should have to suffer this way. Just £67 could buy this toilet room a new tap or fix the existing one. £100 could enabling local people to fix the flush and understand why it needs to be reachable from the space beside the toilet. You could use ‘Euan’s Guide’ cards to remind people not to tie up the emergency cord and take away help from people who might desperately need it. You could save a life and help toilets provide a safer, cleaner and more dignified experience for their users. 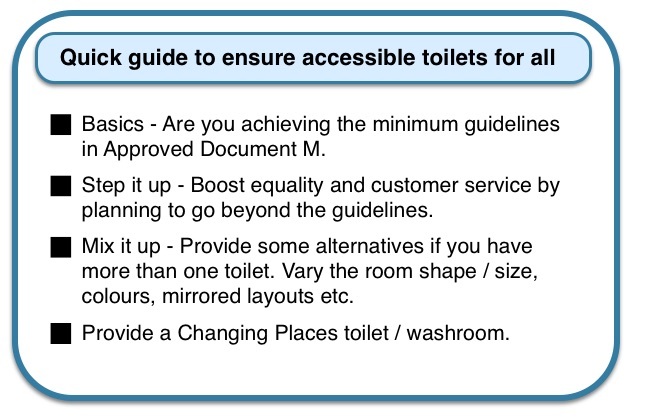 Whilst not a legal guide, information is provided here, and in our guides, to help you assess if your toilet provision is meeting the required standards and your Equality Act duties. Only a court can decide if you have failed to prevent or caused disability discrimination. Similarly, toilets which do not comply with health and safety will be subject to further actions and investigation from relevant safety bodies. In the UK, the Equality Act protects the rights of all disabled people, as individuals – which includes sanitary facilities that are provided. Facilities being offered must provide equal access to toilets for disabled customers / visitors and employees, to the same standard as non-disabled people. This means meeting their Equality Act 2010 obligations. Public bodies such as councils, schools and hospitals have additional duties under human rights law and the Equality Act. The Equality Act does not recognise ‘minimum standards’. An individual disabled person or carer could argue that there has been no ‘reasonable adjustments’, as required by law, as it relates to them. Also, what is ‘reasonable’ changes over time and adjustment is an ongoing obligation. A business should pay close attention to how ‘reasonable’ is judged in courts and described in the Equality Act. Many businesses underestimate the extent of their duty to make adjustments and do what is reasonable in all of the circumstances. Citing ‘too expensive’ or ‘disruptive’ without evidence of a thorough assessment and providing strong reasoning would be unwise. Businesses must take positive steps to remove barriers to disabled people and make reasonable adjustments. They must think ahead and plan to remove barriers – not wait until a person has had difficulties or feels they have been discriminated against. Listen to the experiences of disabled people and if a problem has occurred take reasonable action to prevent discrimination from re-occurring in a timely manner – the ongoing obligations of the Act. If someone doesn’t cooperate with their duty to make adjustments, the Equality Act says it’s unlawful discrimination. The duty to make reasonable adjustment, imposed by the Equality Act 2010, means that provisions beyond that in Approved Document M [AD M] of the building regulations are likely to be required to anticipate the needs of a range of disabled people so they have equal toilet access. You may have to upgrade your toilets now rather then wait for a ‘refit’ or new toilet block to be built. Gaining a thorough understanding of the needs of a range of different people and understanding particular needs e.g. asking “what do we need to do specifically for people with profound and multiple learning difficulties” as opposed to ‘what facilities do disabled people need’ or ‘what is the minimum standard we have to meet’. Auditing toilet facilities thoroughly – not just against minimum standards. Consulting with disabled staff, customers or other organisations to ensure facilities meet a wide range of people with different hygiene needs. Making physical adjustments / building new toilets. Publishing access statements about toilet facilities. Making people aware of the type of facilities you have (e.g. widths of doors, heights of toilets, layout of grab rails, type of lighting etc). Although the guidance in this Approved Document, if followed, tends to demonstrate compliance with Part M of the Building Regulations, this does not necessarily equate to compliance with the obligations and duties set out in the EA [Equality Act]. This is because service providers and employers are required by the EA to make reasonable adjustment to any physical feature which might put a disabled person at a substantial disadvantage compared to a non-disabled person. In some instances this will include designing features or making reasonable adjustments to features which are outside the scope of Approved Document M. It remains for the persons undertaking building works to consider if further provision, beyond that described in Approved Document M, is appropriate. How do I upgrade my existing toilets? To provide good facilities the following types of venues (but not inclusively) should be looking at 1 or more Changing Place toilets alongside provision of toilets that meet the latest building regulations (October 2015) – these have diagrams of exactly how to fit out a toilet, what size it should be etc for maximum accessibility. health facilities such as hospitals, health clinics etc. There is also a British Standard for accessibility BS8300:2009. Guides on our link/resources page will also help you. Smaller venues should look at recent building regulations below and also look at whether other facilities could be offered e.g. a hoist or a changing bench for disabled children if they can not provide a Changing Place. If toilet facilities are not meeting the needs of individual disabled people, organisations must change things to make sure there is suitable toilet provision. Not having useable toilet facilities would be a major barrier to using / visiting , or working for an organisation. Having no usable toilet facilities is also highly likely to prevent substantial income generation from disabled people and their families because they would be unable to visit, or visit for the same length of time as non-disabled people might. Guest Blog – Inclusivity? Let’s talk toilets. Thank you to our guest Blogger this month – Gillian Kemp. and joint founder of Public Toilets UK www.facebook.com/PTUKcampaign – both are facebook campaigns which aim to improve toilet provision in the UK. She has been involved with the British Toilet Association [BTA] for a number of years and has given evidence on the effects of public toilet closures to the Health & Social Care Committee at the Welsh Assembly. Mention the word ‘TOILETS’ and what’s the reaction? Titters? Silence? Embarrassed looks? Jokey responses? Yet once you get past all that everyone has an opinion of some sort on the subject. And toilets – whatever you think of them – are needed by all of us several times a day. Why oh why then aren’t they a regulatory requirement? That is what the campaign PUBLIC TOILETS UK is all about. We are trying to gather evidence to show that public toilets are essential not only for our health but also vital to tourism and the economy. ‘Holding on’ should not be an option. It can damage the bladder and bowel – and reduce concentration if you’re driving. In the meantime Councils are closing facilities when we need more. On the one hand we are told to get out and about but without access to toilets many of us are fearful of stepping outside the door. Those of us with disabilities whether visible or hidden have additional needs when it comes to toilets. Accessible toilets suitable for wheelchair users vary greatly. In some places they are still labelled ‘Disabled toilet’. Well, to me – and I’m not alone, a ‘disabled toilet’ is one that is not working!!!! I visited one recently where I couldn’t even open the door – and I’m not in a wheelchair! – so perhaps that one was named correctly! There are British Standards and building regulations related to toilets but what was appropriate several years ago is, in many instances, no longer suitable for today’s needs. For those of us with ‘hidden’ disabilities such as ilostomies, diabetes etc space is also an issue, so we can attend to our particular needs. Others of us with urgency issues such as IBS cannot stand in a queue and need prompt access to a toilet. We may even need to change our clothes. The only solution to date is to use the Accessible Toilet and I know I’m not the only one to be embarrassed to find a wheelchair user waiting outside. Going to the toilet is not a choice. We shouldn’t have to fight for access to a loo. But the fact is that currently, we do. Toilets are a prime example of inclusivity – currently you might say ‘exclusivity’. In the 21st century we are still changing a disabled person on the floor. This is not acceptable. Thankfully Changing Places facilities www.changing-places.org are increasing, but there are still many places without one. If there are no suitable facilities then we are not an inclusive society. How can we address this? Where to start? We must begin talking LOUDLY about toilets. If you’re embarrassed get over it and join us. Change won’t happen overnight but if we work together we can begin creating an inclusive society – but we have to start at the bottom!!!! !